BasketballHQ.com co-owner and basketball trainer Chris Corbett recently had a chance to catch up with renowned basketball trainer Mark Adams. Mark has a lengthy resume as both a collegiate star and as a basketball trainer to many NBA players including NBA All-Star Paul Millsap. Chris Corbett (Basketball HQ): Tell us a little about the role of drills in your player development practice? 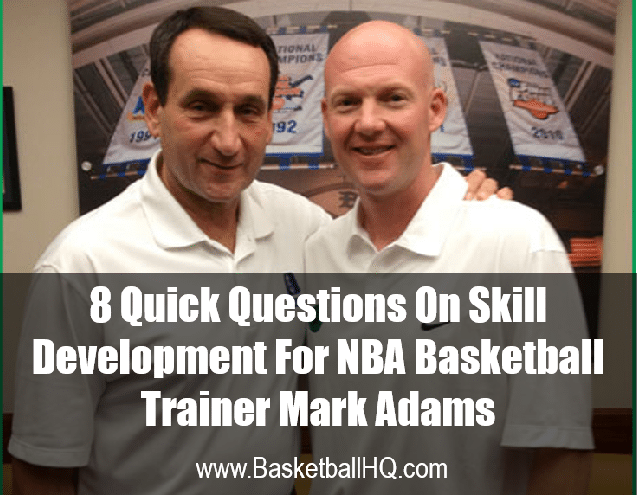 Mark Adams: While drills are crucial to player development, make sure you are teaching/developing skills through the drills. Want them to be players not 'drillers'. Most importantly make sure the drills TRANSLATE. My drills often simulate the specific movements players will do in their teams off/def system. Basketball HQ: When a player comes to you for help, tell us about the process you go through. How do you select the right drill for your players? Mark: Communication with the player and players coach is the key. Once we identify strengths/weaknesses, we can come up with a PLAN & PURPOSE. After gathering as much input & data as possible, I'll put player through an evaluation. The last step is devising drills that will challenge and fit the players needs for improvement. Basketball HQ: Have you experienced players who do everything you ask in drills but don't integrate new skills into their games? How can players, trainers and coaches overcome this challenge? Mark: YES!!! This is very common. Don't just teach how to do a skill or move but WHEN & WHY. One way to overcome this challenge is to do training with live defense which forces players to make the right 'reads'. During live drills - stop and teach what skill/move would work and why. Players must practice making reads against live defense. Basketball HQ: How do you as a trainer increase the aggressive mindset and nature in a player? I mean... are players either born aggressive or not? Can we help "move the needle" and if so, how? Mark: While I do believe players can learn to become more aggressive and tougher through intense competition and training, ultimately some players just have an edge to them. One thing I do is set goals for my players. For example - get to the FT line a certain number of times per game. I also use the power of words with them. Simply remind them before a game to 'ATTACK' often helps. Basketball HQ: Mark, you travel around the country every summer sharing your knowledge at basketball camps (let's share that schedule later,) what can you tell us about positive trends you are seeing in basketball training? What about negative trends? Mark: The biggest positive trend I see are events where coaches/trainers come together to share and learn from each other. Examples include TPG Sports Masters Clinic and the Point 3 Alpha Summit. There's nothing better than when coaches/trainers come together and share knowledge for the betterment of the game. We can all learn and get better through events like these. The biggest negative trend I see involves coaches/trainers trying to be creative/innovative and doing 'flashy drills'. Just because a drill challenges a player and looks cool doesn't mean it TRANSLATES to game like situations. My advice is keep it simple and do basketball drills with specific movements that translate. Basketball HQ: Kids have so many options in basketball now. What percentages of time should be spent on skill development, playing Select or AAU, and strength and conditioning? Basketball HQ: What would be your advice to ambitious players on how to use BasketballHQ.com? Mark: BHQ is the best online basketball resource for coaches and players. Simply identify your needs for improvement and search their website. Find the drills/skills that apply and then come up with a PLAN to implement them into your program/training. Basketball HQ: Mark, you and I can talk player development forever (and we almost did on our last phone call.) Thanks so much for such short, on point answers. Can you share with us a little about how people can connect with you? Mark:Would love to connect! Here are some great ways we can connect.